Phew...that was quite a title. I have to be honest - I have been crafting this post in my head for almost five months now, ever since the first episode of Sheriff Callie's Wild West aired on Disney Junior back in January. Previews for the show started airing last year during the holidays, and the first time my girls got a peek of the pink-ten-gallon-hat-wearing, talking female cat, they were hooked. I was looking forward to a new show in the mix, and knowing Mandy Moore was the voice of Callie (whom I absolutely adore in everything she is in) I had high hopes for the cartoon. And then I watched the first episode...and I wanted to punch all of the characters in the throat. Ok, that might be a little harsh, but I was annoyed from the very beginning - not only by the whiney characters, but by the terrible plot lines of each episode. If you haven't seen the show, here is how Wikipedia describes it: In a western town called Nice and Friendly Corners, everyone is an anthropomorphic and cute animal. They all get along and are friendly to each other. However, there are times when the townsfolk get into problems or don't get along with each other. 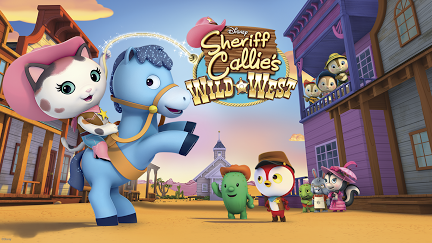 The series follows Sheriff Callie, a female Calico cat and the sheriff of Nice and Friendly Corners alongside her friends Deputy Peck, a male red Woodpecker and keeper of the town jail and Toby, a male Saguaro Cactus. Together they all solve problems and teach the townsfolk to get along with each other while working hard to make the town the friendliest in the west. Yeah, you read that right, one of the main characters is a cactus. Before I even get into why I no longer let my kids watch this show, let me tell you about one of my main gripes about Sheriff Callie's show. I cannot stand a show where animals are made to seem human, but still have animals for pets. Why do all of the animal characters talk, but Callie and Peck still have pets that don't speak, and are actual animals (I speak of Callie's horse and Peck's donkey)? It will always be my main issue with Mickey Mouse Clubhouse...why can Goofy speak but Pluto, who is also a dog, can only bark and acts like an actual dog? I think they should have humans as pets...now that would be a show I would watch...maybe. The real reason I don't like my kids watching this show is because most of the episodes feature a storyline where one of the characters is lying about something, trying to trick someone into doing something or just being a terrible person (woodpecker, cactus...whatever). I kid you not, the majority of the episodes are about someone lying: the stork character making up a story for the newspaper, Farmer Stinky lying about having more peppers than he actually does, Toby the cactus lying about being sick, Peck lying about losing Callie's golden nugget, a salesman lying about the a shirt making people more powerful (yeah this one is a doozie)...every character at one point or another, besides the always-honest Sheriff Callie, is featured in the episode where their storyline is about them not telling the truth. The moral of all of these episodes is, or course, that you should always tell the truth. But are my kids getting that at 4 1/2 and almost 2? Heck no! Do they really understand what is going on in these shows for the most part? Probably not...but I know M, my 4 year old, is starting to get it for sure. A few months ago I heard her fake coughing and then she went on to tell me she was being like Peck from Callie and pretending to be sick. That was the end of Callie in our house. Now every time it comes on tv M goes "oh mom! Callie's on - the show you do NOT like!" Now, Doc McStuffins? There is a show that every kid should be watching. I credit Doc McStuffins with my kids loving to go to the doctors. No joke, they love everything about the doctors, and even constantly play doctor when we are at home. Every episode of Doc has a true to life message that my kids actually understand, like "it's ok to ask for help," or "everyone get's hurt sometimes," or even something as simple as the fact you need to brush your hair and teeth every day. The other day we were playing in the backyard on a hot day and M quickly ran up on the deck under the umbrella. I asked her what she was doing and she said to me, "I have to take a break in the shade for a bit and have some water. Doc said you shouldn't be in the sun too long, and you should take breaks in the shade...and I need to hydrate like that fire truck toy on doc did." Come on now!! The writes and creators of that show should be proud!! I think you need to relax a little. They know the messages and they are well done. Your child was probably just testing you - wanted you to be Callie and reaffirm the message. Ok, I just wanted to make this clear: it was Toby pretending to be sick, not Peck. just putting that out there. Besides that, the characters that lie always tell the truth eventually, except the villains, who get caught and taken to jail. and besides, not EVERY episode has someone lying. Like the one where Peck put the entire town aside from Sheriff Callie in jail. I love doc mcstuffins, don't get me wrong. but a lot of the time, the toys don't tell doc what's wrong with them because they're embarrassed or the want to play more, or they're scared. Or like Lambey, they pretend to be hurt to get attention, just like Toby did! and that is MUCH worse than pretending to be sick. Kids these days pretend they're sick so they don't have to go to school. Though it doesn't make it ok, it's better than pretending to be hurt. You cannot say, "well Lambey told the truth and she learned it wasn't ok to pretend to be injured and she learned a very important lesson," because SO DID TOBY! I want to be notified of replies to my comment, so I'm commenting this. My bad, a little absent minded is all. Let's see, Stuffie: Oh, look, I have a rip in my tail, maybe if i don't tell doc, it will go away. Lambie: I hate that Daisy is getting more attention than me. I'll fake an accident to try and get them to pay attention to me. Stanley: I'm broken, lonely and can't be fixed so I'm going to break other toys so I'm not lonely anymore. Half the other toys in the show: Oh no, we're broken! Let's not tell Doc and maybe no one will notice! Maybe you should think a little more before going on a rant. Yeesh! You sound like a horribly mean person.